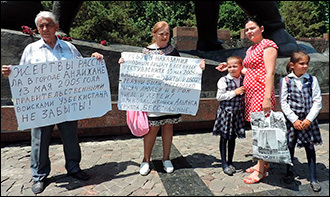 Activists of the Human Rights Alliance of Uzbekistan (PAU) held a traditional action in the centre of Tashkent at the foot of the ‘Courage’ monument on 13 May to commemorate the hundreds of peaceful Andijan residents, who died during the shooting of the rally 12 years ago. To the surprise of the participants, this time the event passed without any interference by the Ministry of Internal Affairs and the National Security Service (SNB). 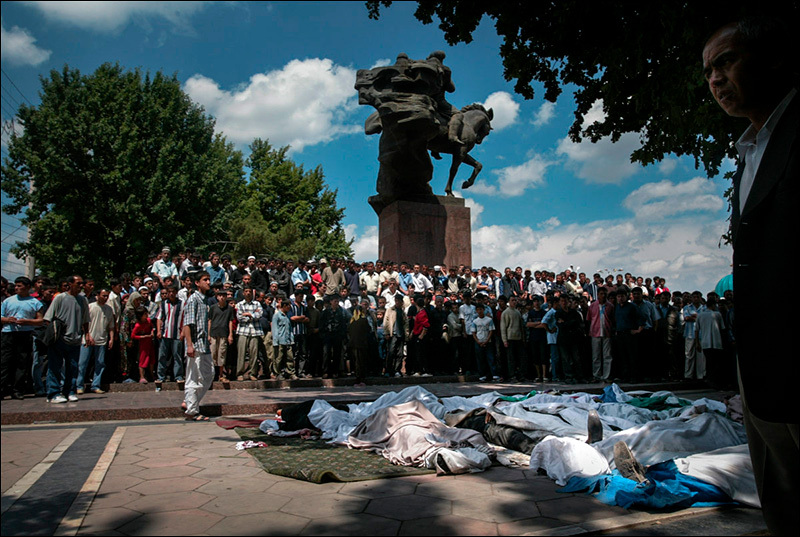 The first time such an action was held at the ‘Courage’ monument on 15 May 2005, two days after the Andijan tragedy. Every time the protesters were detained by the police and SNB; they were taken to the Tashkent courts where some of them were sentenced to large fines. It happened even if there had been no posters in the hands of human rights activists - only flowers and children's toys. Sometimes potential participants of this action were blocked in their homes in the early hours of 13 May preventing them from leaving the house. The organiser of the action - the leader of the PAU Elena Urlayeva - informed the central police on duty of the Ministry of Internal Affairs just calling the number ‘102’ about the upcoming event in advance. 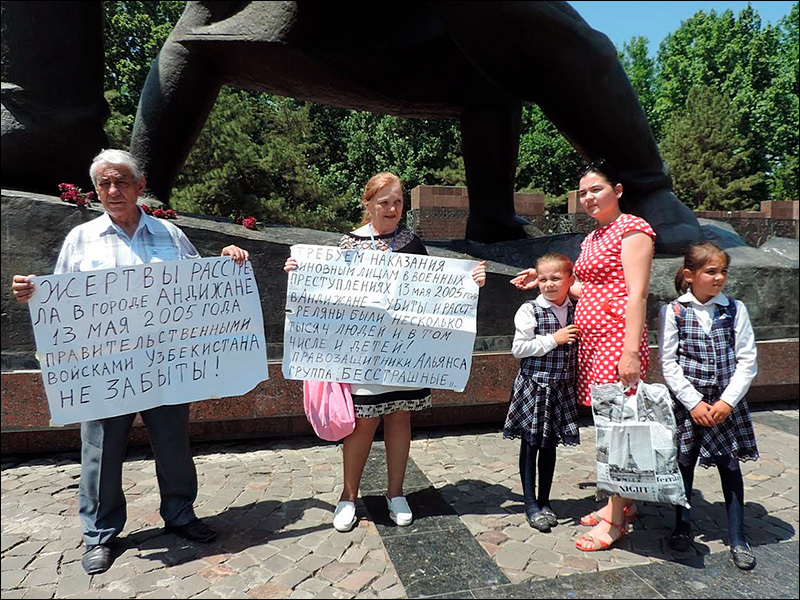 Except for a few human rights activists and the family who specially arrived from Jizak (city in Uzbekistan), and a handful of curious tourists, there was nobody at the ‘Courage’ monument on 13 May this time. Human rights defenders laid flowers and several toys at the monument, then unfolded posters with which they stood for about an hour. ‘The visit of UN High Commissioner was held on the eve of the memorial day of the victims of the Andijan events of 2005. And it is important to note that this was the most inconvenient topic for the Uzbek government at the meeting. It shows that even after 12 years, the UN General Assembly resolution that condemns Uzbekistan for its refusal to investigate the events in Andijan remains relevant, and the consequences of this massacre deserve the attention of the international community,’ says the head of the French-based Association for Human Rights in Central Asia Nadejda Ataeva. 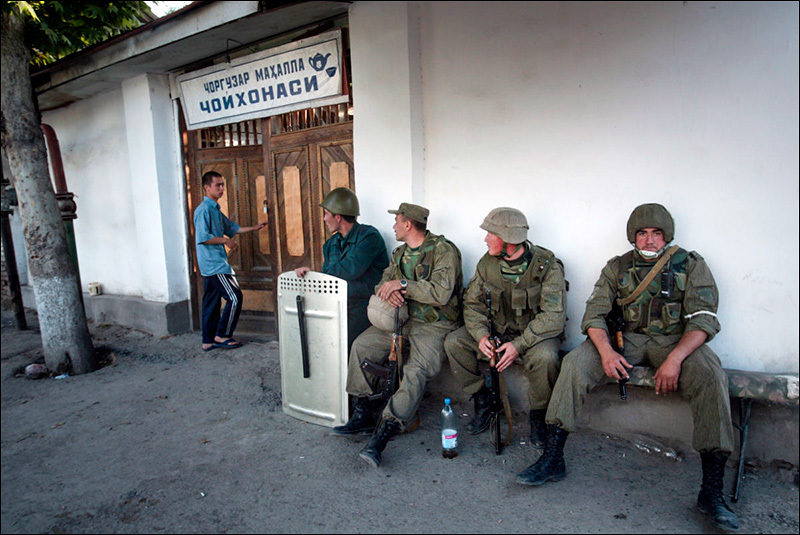 According to the official version, in the early morning on 13 May 2005 and the next day an armed seizure of the prison and a number of government buildings was carried out in Andijan. During the attack, 12 law enforcement officers were killed, 334 weapons were captured. Law enforcement authorities of Uzbekistan reported that terrorists took a total of 70 people hostage, 15 hostages were killed. Later, troops entered Andijan. According to official data, 187 people died. Later, at least 358 people were sentenced to long terms during secretive trials; no relatives of convicts, lawyers or human rights defenders could get detailed verdicts; there are more than one hundred people suspected of involvement in the Andijan events wanted by the Uzbek authorities; from 2005 to 2008, at least 125 suspects in the Andijan case were arrested in the CIS countries. An international investigation into the Andijan events was never held. The convicts in this case continue to remain in custody, although the term of imprisonment that was set for them has expired: they have been added terms for minor violations which is called ‘raskrutka’ (‘unwinding’) in prison jargon. There are a lot of materials can be found on this subject online. Among them - the OSCE report (ODIHR) on the events in Andijan, as well as report by Human Rights Watch. The Fergana News Agency Gallery houses Andijan photographs taken after the shooting by The New York Times correspondent Yola Monakhova, and photographs of the famous freelance photographer Denis Sinyakov who flew to Andijan immediately after the tragedy.